What are the Pros and Cons of a Cork Floor? One of the main reasons for increased demand of cork flooring is due to its eco-friendliness. No trees are harmed during the extraction of cork and the process can be repeated every 9 years, up to 15 times per tree. A cork floor is not only a natural product, it is also biodegradable once it reaches the end of its life cycle. Another benefit of cork is the cushioned texture that feels soft and springy underfoot. This makes it a great choice for areas where you tend to stand for prolonged periods, such as the kitchen. This is better for your back and joints as it reduces pressure when standing. Cork also absorbs the impact if fragile items are dropped, making them less likely to break compared to other floors. Cork is a great material for repelling dust and particles, ideal for people who suffer from allergies. It also has antimicrobial properties. Together, these features ensure a healthier environment with better indoor air quality. 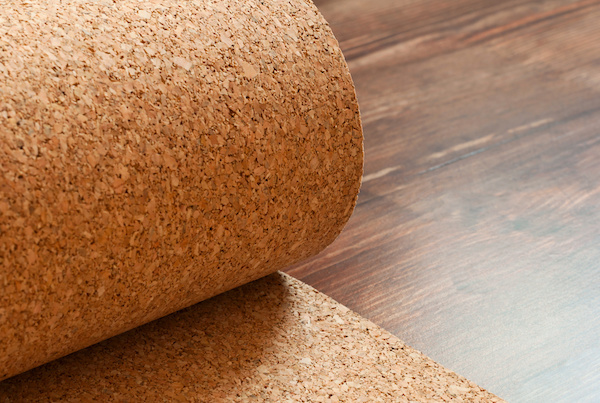 Cork simply requires regular sweeping and vacuuming to eradicate any lingering particles. Exposure to sunlight can cause cork floors to fade and discolour over time. Be aware of placing furniture or rugs over spots as the surrounding floor may fade whilst the floor under the items retains colour. Fading can be reduced by installing good quality curtains or blinds. Cork is refinished with a sealant which provides some protection from water spills however liquids can still seep through cracks if not wiped immediately. The floor can also stain, showing water marks or discolouring from spills such as red wine. Bear this in mind when deciding which rooms to install cork in. Though cork is incredibly comfortable underfoot, this does come with a disadvantage. The soft material makes it more susceptible to gauging, punctures and dents from furniture, dropping sharp objects or high heels. Surface scratches are also a potential problem, especially if you have pets. In many cases, it is clear that the pros outweigh the cons and there are simple measures you can take to reduce the cons from occuring. To see our range of cork flooring, click here or call us on 1300 823 958 for more information.